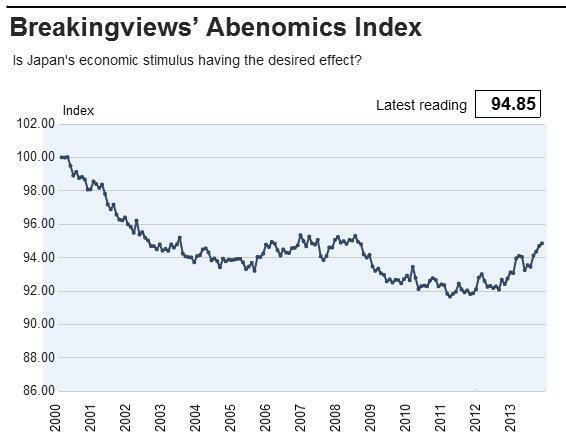 The Breakingviews Abenomics Index improved for the fourth straight month in December. But it masks two risks. A vanishing current account surplus means relying on foreigners to finance bloated public spending. Besides, struggling wage growth could stall private consumption. The Breakingviews Abenomics Index rose for a straight month in December, ending the year at 94.85, its best annual close in six years. Six out of 10 contributors to the overall index rose, including consumer prices, inflation expectations, bank lending, manufacturing, housing starts and stock prices. Wages and consumption fell, the current account deficit widened and bond yields hardened.